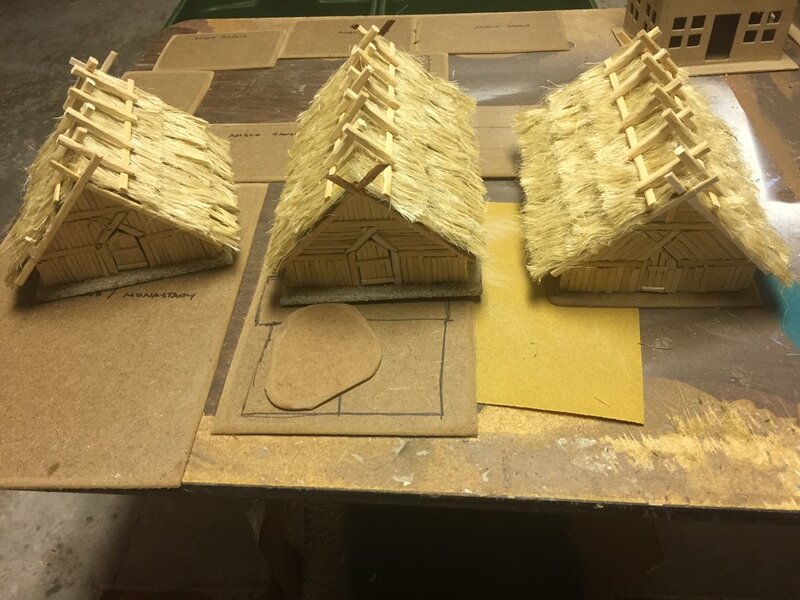 “How to make thatched roofs” might not be a totally honest title for this post. It gives the impression I really know what I’m doing. Maybe it should probably be “How I made some bad thatched roofs, and some less bad ones”, but what’s more informative than watching someone else’s mistakes? The first seemed like a fancier version of the second, but I already had rope so I thought I’d give that a go. As for teddy bear fur, this is what you’ll get in kits from 4Ground. I don’t think it looks at all bad and I nearly went this route myself. Done well it seems to look alright, I’d still like to give it a go. Frankly, don’t do it. I had been spurred on by people like @flukestarbucker on Twitter making lovely things using this method. He however is an amazing modeller and I’m not, so I don’t think my efforts came to much. This is a really laborious method, you’ve got to untwist the rope, then cut off each little chunk and try to get the kinks out of it before gluing it on. Keeping the depth of thatch even is tricky, the fibres can end up pointing all over and frankly it doesn’t have the bulk that a thatched roof should have unless you put loads of layers on (sod that). I tried it on the smallest roof I had, and was bloody glad I didn’t try and do a bigger one. The rope I used was very light coloured, so I gave it a bit of a brown wash, which settled it down. To hold the little fibres in place I put several layers of thinned PVA on it, I gave it a brush with an old toothbrush before the first coat, but even after that you’ll probably be picking out strays and tidying it up on subsequent coats. It’s a lot of faff for a pretty dubious effect in my opinion. What a revelation. I got a cheap towel from Asda and cut it into strips. All you need to do is pay attention to which way the fibres lay and put it on the right way around. Go for fairly wide strips and overlap them a bit. You’ll need to tidy up stray fibres and loose bits with scissors, then give it a bit of a brush (I used an old toothbrush) with very watered down PVA. Unlike the rope method multiple coats aren’t really needed for this. 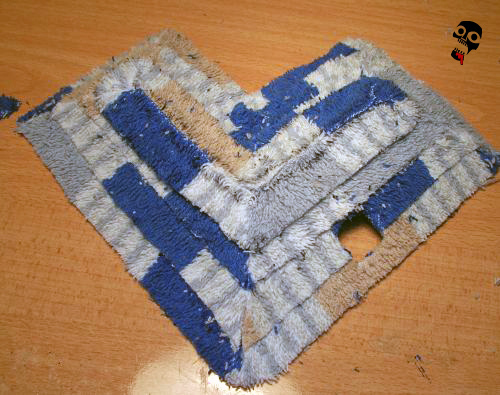 Compared to messing about sticking on fibres this method is a lot faster , and to my eye looks more realistic. Real thatched roofs have a lot of bulk, which you get from towels. It also hangs over the eaves better. I suppose if you were keen you could use cut up towels to give the roof some bulk and shape, then stick on fibres, but I think the towels themselves look good. The colours look a but odd in the photos above, and don’t really reflect reality but they do show roughly how it looks. If I was going to do it again I’d go slightly bigger and do more of an overhang over at the eaves. Bottom line is that I reckon between these two techniques the rope fibres probably look slightly better up close (and hence look ok in pictures) but I think the towel method actually looks better at the distance you see it on the table, and is a whole lot less work. A very useful post. Towels it is then.